A new species, Ameerega shihuemoy, has been described from Peru. The new species, described by Rojas-Serrano and colleagues in Zootaxa, is known from Madre de Dios department in Peru, in the vicinity of Manu National park. Although the new species somewhat resembles A. yungicola, it is in fact a close relative of A. macero, which also occurs in the region. Overall this paper was extremely thorough, using a combination of phylogenetics, bioacoustics, and morphology. Serrano-Rojas, S.J., A. Whitworth, J. Villacampa, R. von May, R.C. Gutierrez, J.M. Padial, & J.C. Chaparro (2017). A new species of poison-dart frog (Anura:Dendrobatidae) from Manu province, Amazon region of southeastern Peru, with notes on its natural history, bioacoustics, phylogenetics, and recommended conservation status. Zootaxa 4221:71-94. In other news, Juan Salvador Mendoza Roldan has generously contributed a species account for Andinobates opisthomelas. The account is very thorough with lots of natural history information. Check out the account here. With the update of this website, one of our new goals is to add species accounts for the entire subfamily Dendrobatinae, rather than focusing only on Peruvian species. With that in mind, we’re happy to announce that an account for the enigmatic species Andinobates abditus has been added. This account was contributed by Santiago Ron from AmphibiaWeb Ecuador who offered to allow us to post a translation of their account. Andinobates abditus is one of only few remaining “lost species”. It has not been seen in decades, despite relatively recent attempts to find it. Given that there are only two photos of this species in life, we’ve instead decided to use artwork from Ted Kahn for the species account image. This drawing, as well as many others like it, can be found in the new Conservation International volume “Aposematic Poison Frogs (Dendrobatidae) of the Andean Countries”. 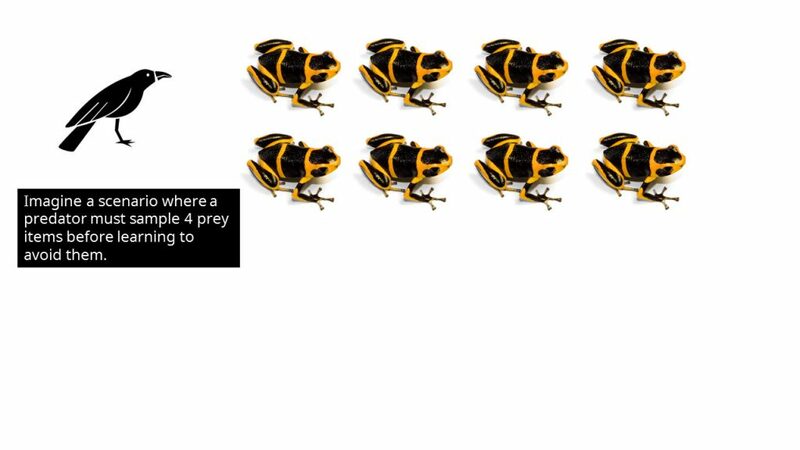 After several years of dormancy, dendrobates.org has been updated. The current format allows for easier posting of blog-like updates, where the plan is to post about current research on poison dart frogs. Although I have wanted to update the website for a long time, it wasn’t until I was contacted by Erik Melander that the project materialized. Erik generously offered to do a website redesign (more of a resurrection, really), while also offering to stay on as website administrator. Since the last website updates, there have been a number of new species described. One of these, Excidobates condor (Almendariz et al. 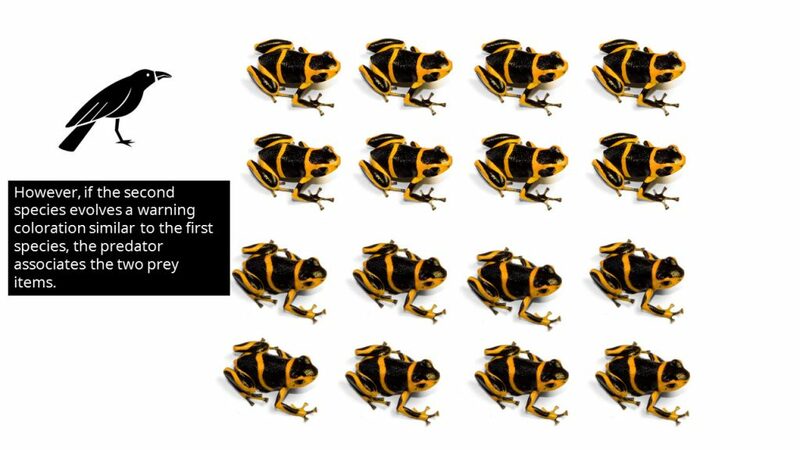 2012), is remarkable in that it is the first entirely black poison dart frog. The authors also present larval data to suggest Andinobates abditus is actually a species of Excidobates. Following these results the genus Excidobates now contains three (likely four) species: E. mysteriosus, E. captivus, E. condor, and (likely) E. abditus. Two new species of Andinobates have been described: The first of these Andinobates cassidyhornae (Amezquita et al. 2013) is a member of the bombetes group but differs from all other species phylogenetically and bioacoustically. Superficially, the species appears similar to A. opisthomelas. The next new Andinobates is A. geminisae (Batista et al. 2014), which is a remarkable discovery in that the species occurs in a relatively well sampled area (north Panamanian coast, east of the Bocas del Toro). This species bears a striking resemblance to Oophaga pumilio but the two species are not closely related. Rather, Andinobates geminisae is closely related to A. minutus and A. claudiae. Almendáriz, A., Ron, S. R., & Brito, J. (2012). Una especie nueva de rana venenosa de altura del género Excidobates (Dendrobatoidea: Dendrobatidae) de la Cordillera del Cóndor. Papéis Avulsos de Zoologia (São Paulo), 52(32), 387-399. Amezquita, A., Marquez, R., Medina, R., Mejia-Vargas, D., Kahn, T. R., Suarez, G., & Mazariegos, L. (2013). A new species of Andean poison frog, Andinobates (Anura: Dendrobatidae), from the northwestern Andes of Colombia. Zootaxa, 3620, 163-178. Batista, A., Jaramillo, C. A., Ponce, M. A. R. C. O. S., & Crawford, A. J. (2014). A new species of Andinobates (Amphibia: Anura: Dendrobatidae) from west central Panama. Zootaxa, 3866, 333-352. A new genus, Andinobates, is described for most of the species previously contained in Minyobates. A new species, Ranitomeya toraro, is described from Brazil. 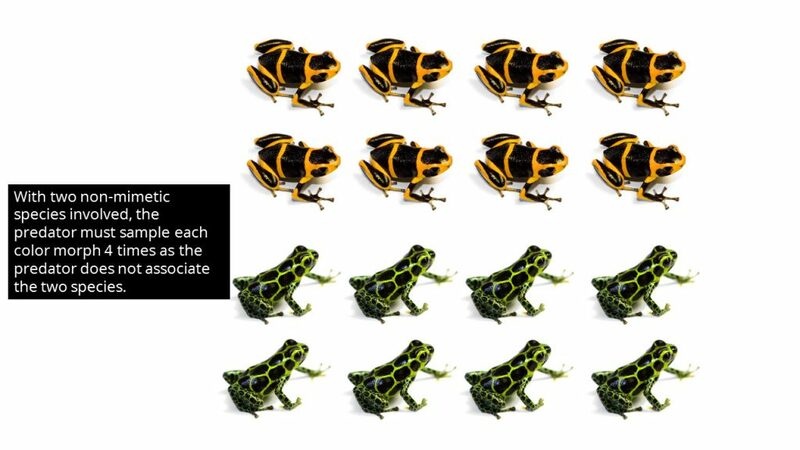 Ranitomeya duellmani is synonymized with Ranitomeya ventrimaculata due to confusion surrounding the original type series of the latter species. The definition of Ranitomeya variabilis is greatly expanded to include what was being referred to as R. ventrimaculata prior to this paper. Phylogenetic and bioacoustic evidence suggests that Ranitomeya amazonica is indeed a valid species. Ranitomeya lamasi and R. biolat are synonymized with R. sirensis. Ranitomeya ignea and R. intermedia (which were recognized as full species by Grant et al. 2006) are placed back into synonymy with R. reticulata and R. imitator, respectively. Ranitomeya rubrocephala is designated a nomen dubium and should be removed from species lists. Other additions and contributions of the paper include: a) explicit definitions of species groups that reflect the current phylogeny, b) detailed distribution maps for all currently recognized species of Ranitomeya, c) tadpole descriptions for several species, d) summary of call data for many species, e) discussion of the current debate on whether or not to accept the Grant et al. (2006) taxonomy. Many people seem to think taxonomists only make taxonomic changes so that they can keep their jobs. We can assure you that this is not the case. An accurate taxonomy is a critical foundation for any biological research. Many people who have the luxury of working on North American or European taxa take this for granted. Studies of biogeography, community ecology, evolution, etc. 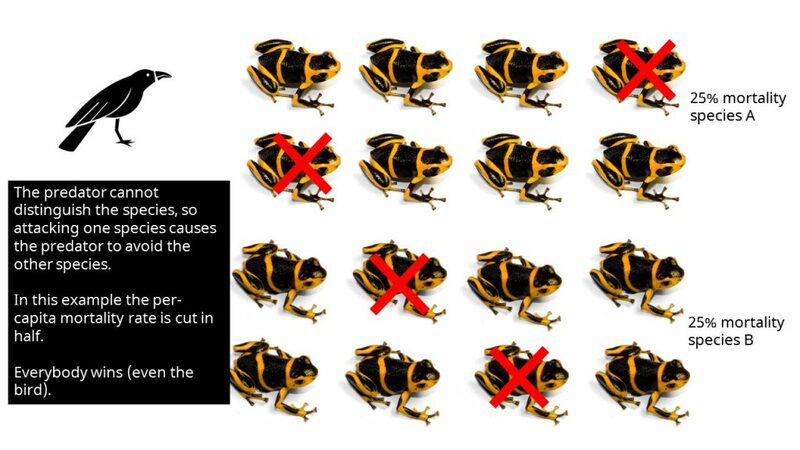 often use a species as an evolutionary unit. 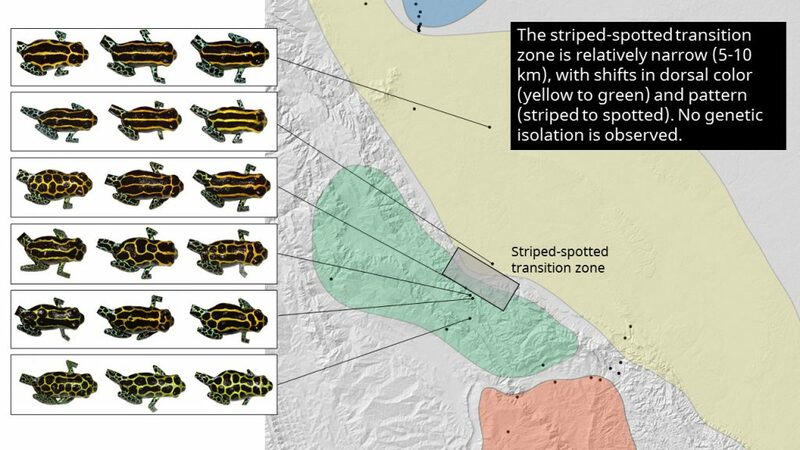 How could speciation research exist without an accurate assessment of species boundaries? Furthermore, as species are generally considered to be the ‘currency’ of conservation assessments, it is imperative that species are accurately defined if we are to make effective conservation decisions. 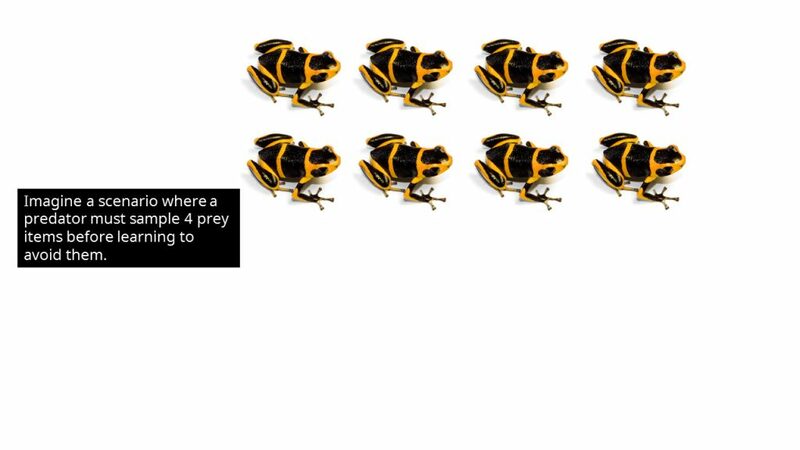 Messy, old taxonomies only serve to promote confusion; the goal of our paper is to clean up some of the confusion that has surrounded the genus Ranitomeya. 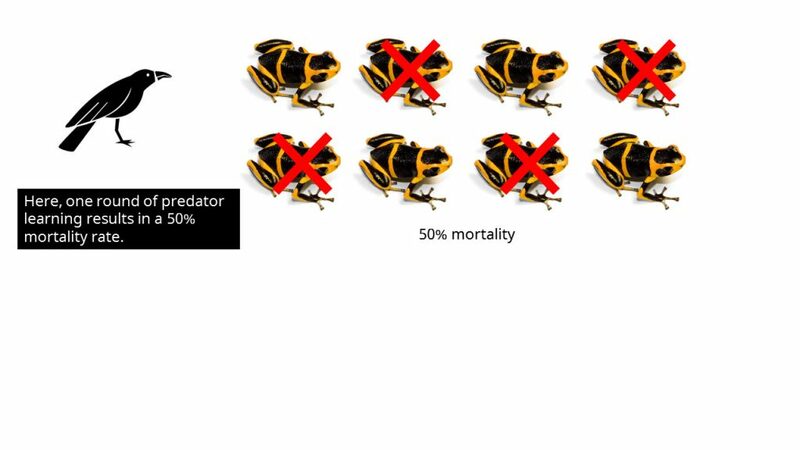 Below we discuss some of taxonomic changes which will be of interest to the general poison-frog enthusiast, and offer some explanations as to why these changes were made. 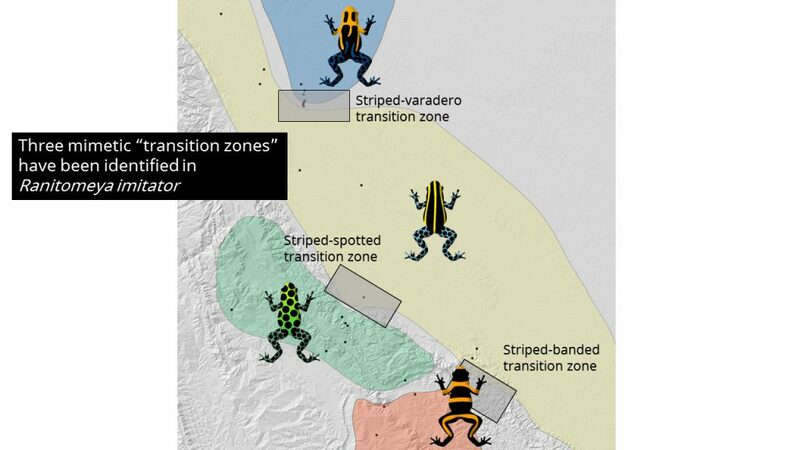 The existence of two speciose, reciprocally monophyletic clades (two lineages that evolved independently), within Ranitomeya has been recognized for decades. Myers (1987) acknowledged this diversity this when he described Minyobates to include the north-Andean, Chocoan, and Central American ‘diminutive’ species. Our current Andinobates is essentially identical to Myers’ Minyobates, except for M. steyermarki. 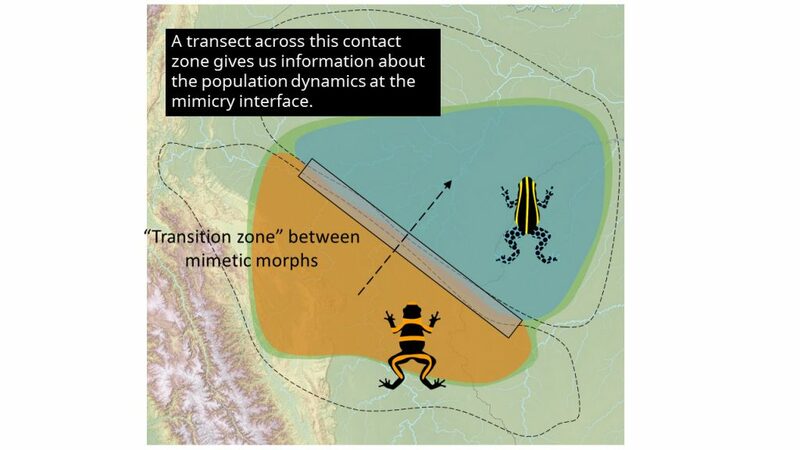 One might ask: Why don’t we just use the name Minyobates to refer to these frogs, rather than erect a new name Andinobates? The reason is that the type species for Minyobates, M. steyermarki, belongs to a very different lineage than our current Andinobates. 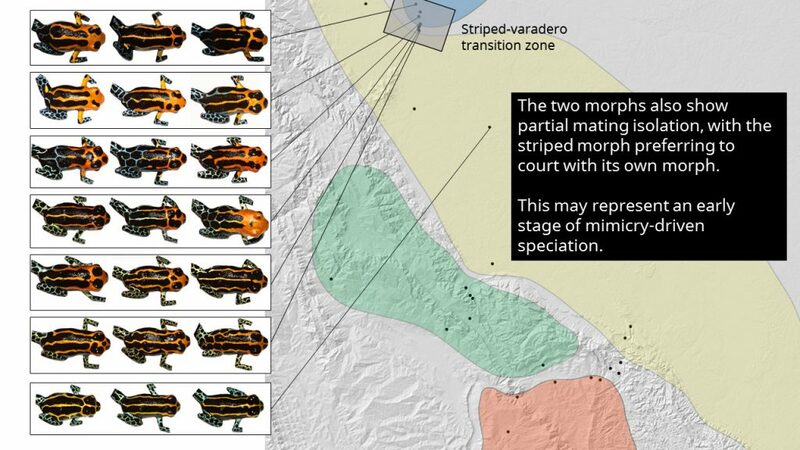 When molecular data became available in the early 2000s, it became clear that steyermarki was not closely related to the rest of the putative Minyobates species, and it has since been retained as a one-species genus. Nomenclatural rules dictate that the genus name must follow the type species wherever it goes (taxonomically speaking). Therefore, all the “old” Minyobates essentially had their name taken away, and by default became part of their most closely related genus (which for a while was Dendrobates and more recently became Ranitomeya). Our description of Andinobates reflects the diversity which Myers recognized when he described Minyobates, and is thus in a sense a return to an older taxonomic arrangement. 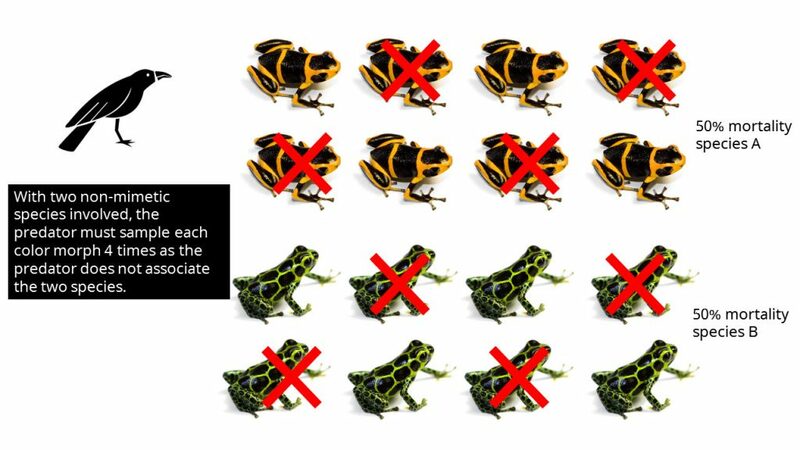 This also brings cohesiveness to the current definition of Ranitomeya. These two genera differ in several ways. First, they represent two very different biogeographical radiations, with Andinobates occupying the northern Andes of Colombia, the Choco, and lower Central America, whereas Ranitomeya is completely Amazonian. Second, there are good morphological characters which diagnose these genera: Ranitomeya can be diagnosed by the presence of pale limb reticulation (with a couple exceptions, particularly in mimetic forms of R. imitator), and Andinobates has 2nd and 3rd vertebrae fused. Now that we have sequence data for many species of Andinobates, we are confident this taxonomic arrangement is robust. This is one of the weirder and most unexpected outcomes of our revision. Here is a history of the scenario: The original type series of Ranitomeya ventrimaculata was collected from Sarayacu, Ecuador in the 1930s. There are actually two species present in Sarayacu: “duellmani” and “ventrimaculata“. The holotype of ventrimaculata was described as having parallel, pinkish dorsolateral stripes. Many years later, Schulte (1999) described Dendrobates duellmani from northern Peru. In fact, the species that Schulte (1999) described was the same species as the holotype Shreve used for his ventrimaculata. It is quite a confusing situation– but the bottom line is this: Shreve’s holotype of ventrimaculata was the same species as Schulte’s duellmani, thus, due to precedence, the name ventrimaculata is the valid name. So what happens to everything that was referred to as ventrimaculata prior to this revision? This is another confusing matter and involves some more obscure taxonomic legislation. 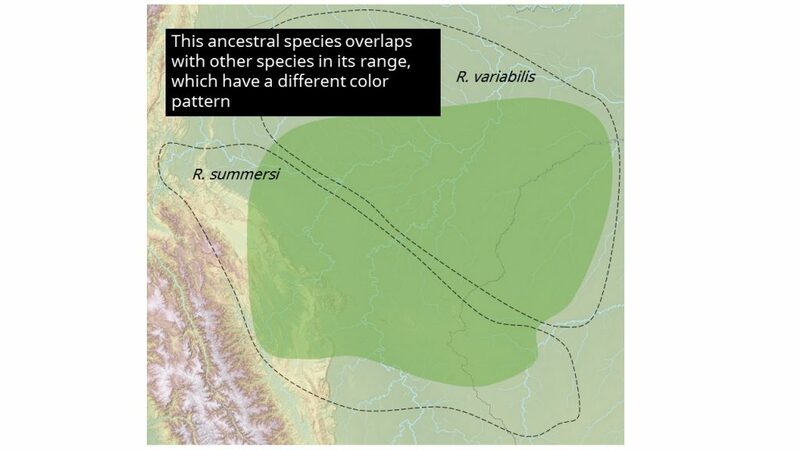 Originally, going into this project, we had planned to synonymize variabilis with ventrimaculata (in the old sense) as phylogenetic, morphological, and bioacoustic data suggests a single species. However, the name ventrimaculata, as mentioned above, had to be transferred to the frogs which were being called duellmani. This means there was a species which had its name taken away. As it turns out, the oldest available name for this species is variabilis. So, ironically, the name variabilis now gets applied far more broadly to everything that was previously considered ventrimaculata. Despite initial skepticism, Ranitomeya amazonica continues to receive support as a valid taxon. One of the main goals of this revision was to address the taxonomic issues surrounding R. variabilis (in the new sense) and its close allies (e.g. amazonica). 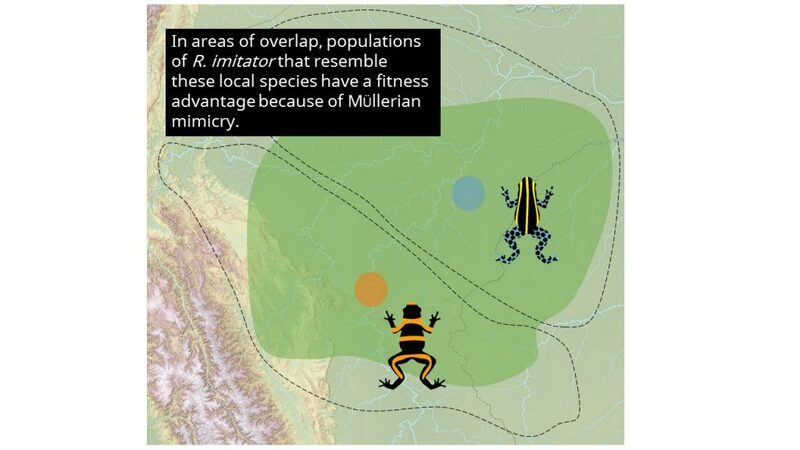 It is clear that, when looking at results from phylogenetic analyses, there is a deep divergence between frogs associated with the Amazon (Iquitos, Leticia, eastern South America) and frogs from the upper Amazon/east Andean versant. Although diagnostic characters for R. amazonica have remained elusive, we conducted a large-scale analysis of advertisement calls and found that differences do exist between these two clades. Therefore, on the basis of phylogenetic and acoustic data, there was no strong evidence to suggest that R. amazonica should be synonymized. From a practical standpoint, as far as we can tell, all individuals that are orange or red (mostly from the vicinity of Iquitos) fall within the amazonica clade (e.g. “red vents” should be treated as a “line” of R. amazonica). Furthermore, all frogs from French Guianan origin also should be treated as R. amazonica. Interestingly, R. variabilis (sensu the current revision) and R. amazonica come into very close contact south of Iquitos, and may even be sympatric in some areas, such as the Rio Tigre. More research is needed to determine how species boundaries are maintained in these contact areas. Ranitomeya sirensis has been considered one of the most enigmatic poison frogs since its description in the early 1990s. 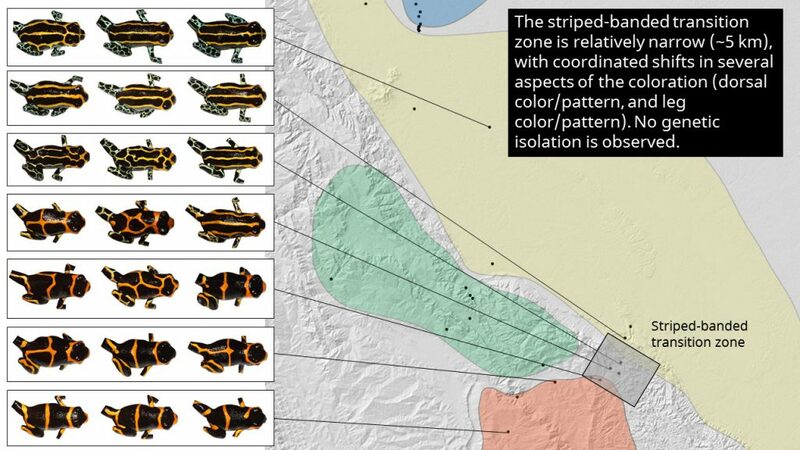 Its unusual color pattern, coupled with the fact that it occupies a remote and isolated mountain range, left many researchers wondering how it was related to other Ranitomeya species. In 2007, Jason Brown, Evan Twomey, Mark Pepper, and Manuel Sanchez were successful in finding topotypic material in the Cordillera El Sira. Needless to say, we were quite surprised when phylogenetic data came back that placed this species directly in the middle of R. lamasi, rendering the species paraphyletic (in molecular taxonomy, the basis for species are unique evolutionary lineages). In 2008, another expedition shed further light on this issue. In this trip, several individuals from both “species” were seen breeding together in the foothills of the Sira, and furthermore, some intermediate individuals were found (e.g., individuals that looked like sirensis but with faint, scattered black markings). Thus, there was strong behavioral evidence which corroborated our phylogenetic evidence: that lamasi and sirensis were actually the same species. 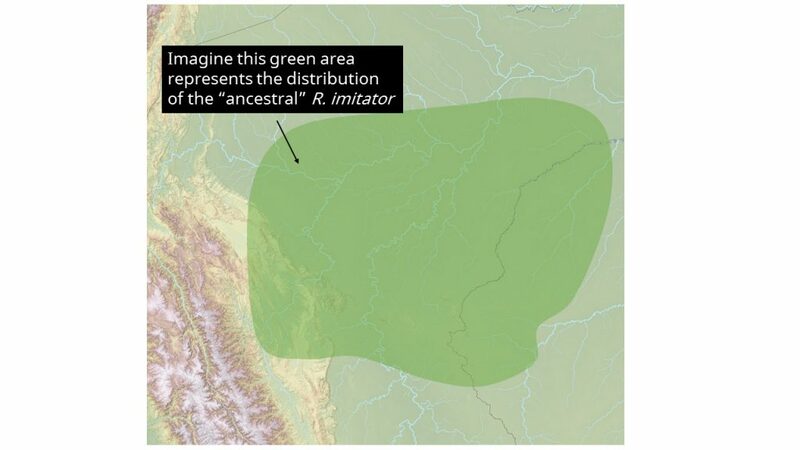 Additionally, extensive sampling of R. biolat has failed to provide evidence that it is a distinct species from R. lamasi, with many putative biolat individuals interspersed throughout the lamasi clade. Although there are instances where gene trees and species trees may not coincide, in this case we had no reason to suspect multiple species were involved (mostly on the basis of similarity in morphology and advertisement calls). Thus, all our data suggested that biolat, lamasi, and sirensis all belonged to a single, widespread, polymorphic species. Due to taxonomic rules, when this sort of thing happens, the name which came first is the valid name. In this case, sirensis was described first (Aichinger 1991), coming one year prior to Morales’ (1992) description of biolat and lamasi. Thus sirensis becomes the valid name. 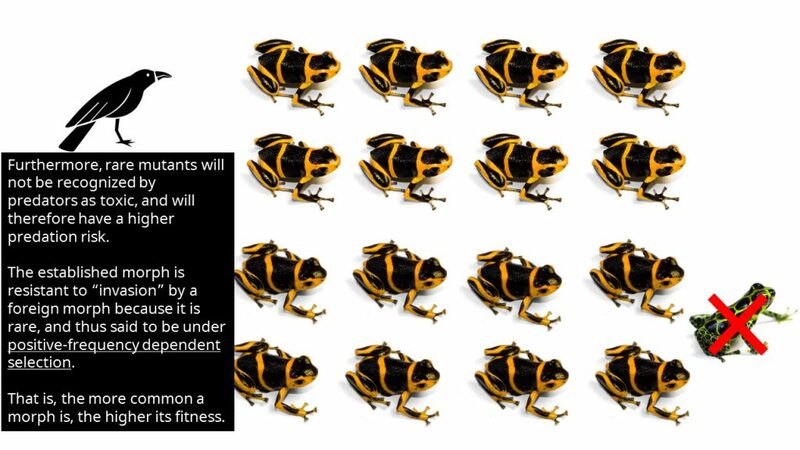 It is ironic that sirensis, which was previously thought to be one of the rarest and most enigmatic poison frogs, is now one of the most widespread and polymorphic species known. For hobbyists, this change is simple: everything that was previously called lamasi is now sirensis.